he Parker Reflex was introduced in 2000 and sported acros-hatched rubber grip section. It had a newly designed clip with a small head, designed not to get hooked in the fabric of the pocket, it also sported six small lines, hint of tines of the feather, and an indentation, a line running the length of the clip. It was riveted to the cap, approximately a centimeter from the top on the fountain pen and roller ball and half a centimeter on the ball pen and pencil, the latter two having had a cylindrical button on top. The Reflex was manufactured with a moulded plastic barrel and cap and stainless steel trim. It was offered as a fountain pen with a steel nib, a cap actuated roller ball and button actuated ball pen and pencil. 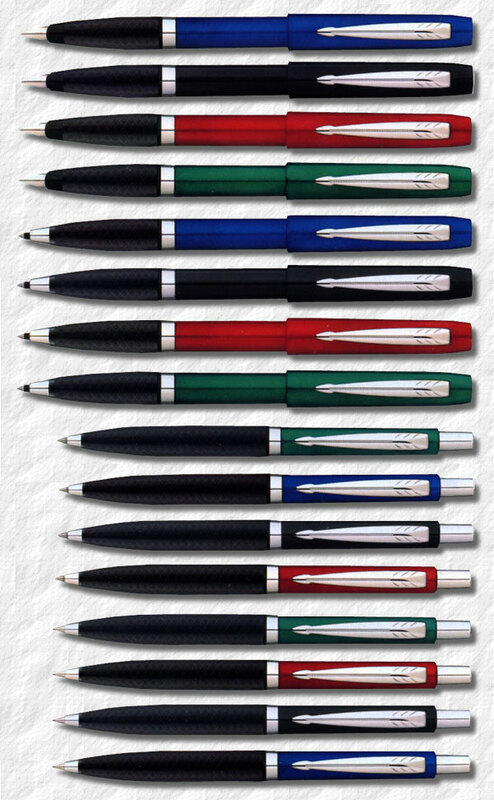 Before christmas 2001 a stainless steel version was introduced to the line but only as a ball pen and pencil. A january 2002 pamphlet depicts an interesting clip variation. The six tine-lines was replaced with two opposite parallellograms, creating the impression of stylized feathers and the middle indentation was missing. The panphlet however depicts both clip styles and adds a new colour, Translucent Blue was also added to the line, but only as a gel pen. Stainless Steel (bp,pcl) This setup remained until it was discontinued in 2007 when the whole line of Parker pens were overhauled, discontinuing such workhorses as the Parker "45", Rialto and Insignia, and also the Parker "100", Dimonite and, of course, the Reflex. Parker Reflex, note the parallellogram clip, 2002.